On April 3rd we pushed away from the Atlantic Yacht Basin dock and started our trip to Fort Lauderdale. We have done this run before but it’s always a thrill. Our goal was to do as much offshore cruising as possible. 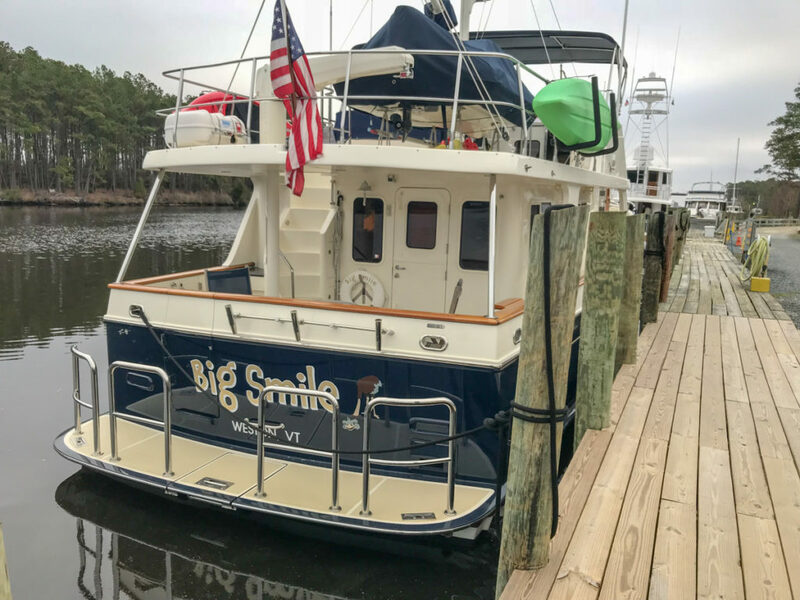 We have found that Morehead City, NC, has a perfect inlet to access the Atlantic Ocean. The first days run from AYB was a long 12 hour motor to the bottom of the Alligator River. 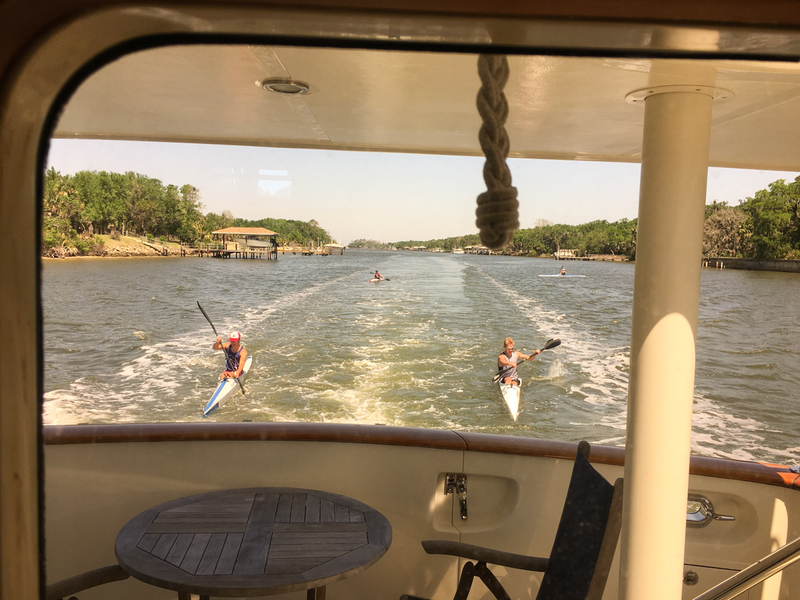 An early start from the Alligator River got us to Morehead City around 11AM and from there out through Beaufort Inlet and into the Atlantic. 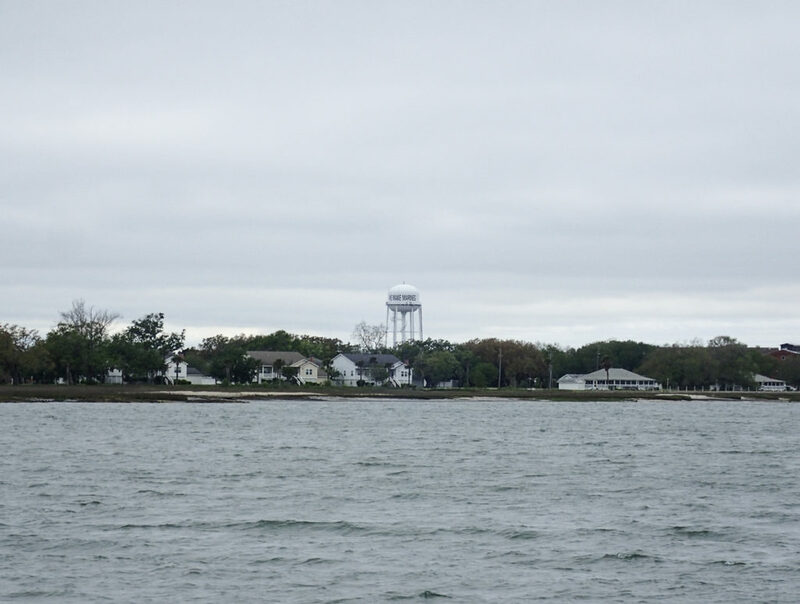 Prior to that, while passing by Oriental, NC, we were hailed on the VHF by a north bound Fleming yacht. He asked for my cell number as he had just taken a couple of shots of us going by and wanted to text them. Below is one of photos he sent. Out into the Atlantic we went and luck was on our side. 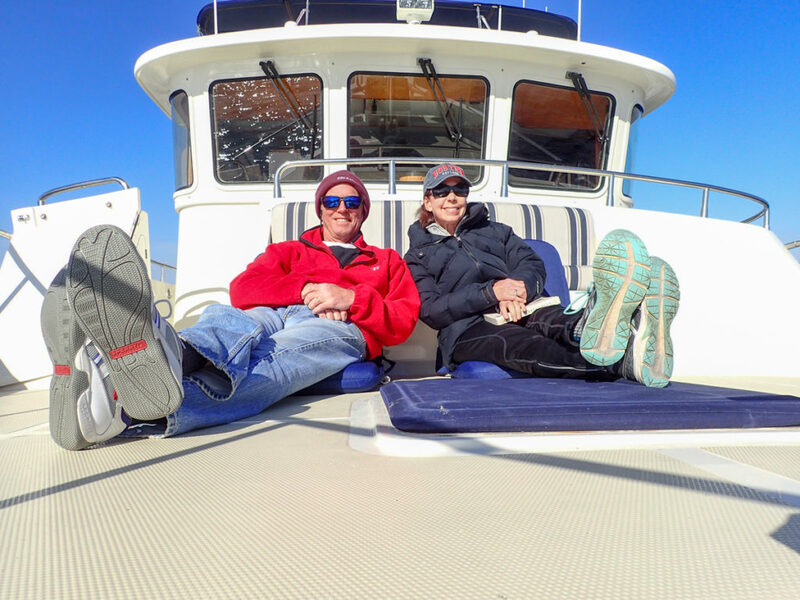 The wind and waves were off our stern quarter so we had a very pleasant offshore, overnight run to Charleston, SC. 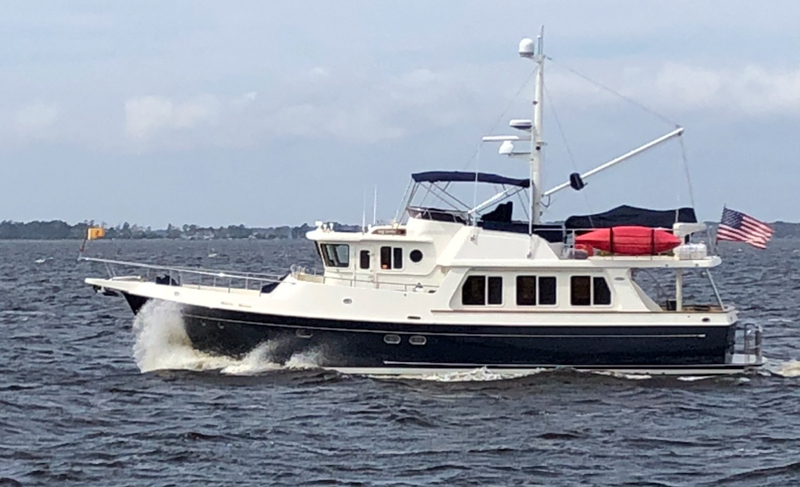 We approached the very busy Charleston Harbor entrance around noon and with no plans to to stop in Charleston, we continued on down the ICW for three more hours before dropping the hook in a very pleasant anchorage named Church Creek. 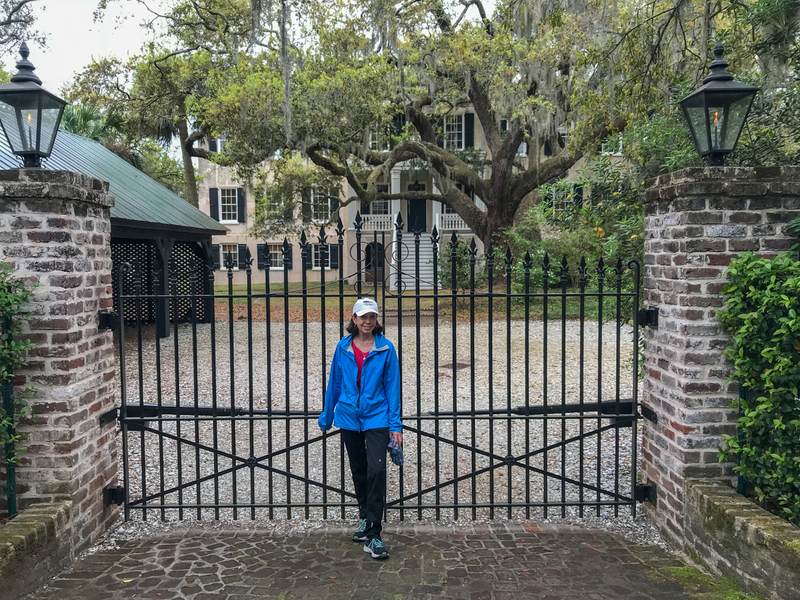 As we motored down the ICW this trip, we decided to stop in a small city in South Carolina that we had passed by in previous years but never visited. Beaufort, SC (as opposed to Beaufort, NC) has a decent marina right in the center of town. Beaufort was chartered in 1711, making it the second oldest city in South Carolina behind Charleston. It is an easy city to walk and we loved the antebellum architecture. It is also well known for its military establishments being close to Parris Island and home to Marine Corps Air Station Beaufort. After one full day in Beaufort, we were off to Hilton Head. 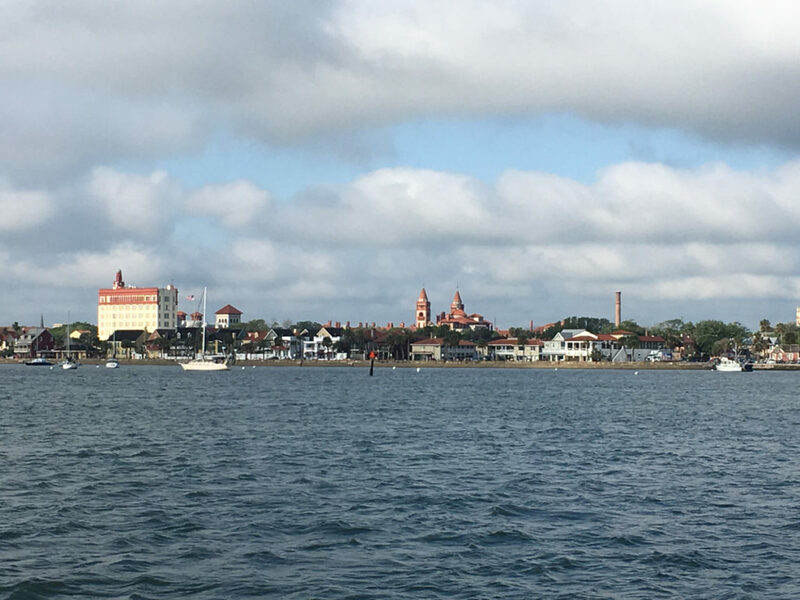 We had a one night reservation at the iconic Harbour Town Yacht Basin at Sea Pines Resort. The distinctive red and white striped lighthouse has beckoned boaters for over forty years. 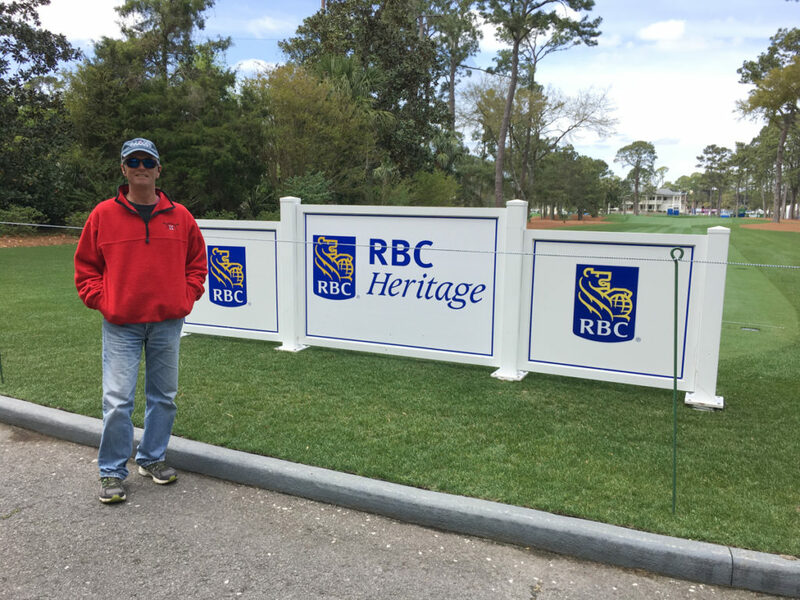 Unbeknownst to us, there was a golf tournament that week and the entire Sea Pines Resort was decked out for it. We arrived at the beginning of the week so final preparations were taking place. While we saw no golfers, we experienced some of the hype. It’s obvious that lots of corporate money goes into a golf outing and this was no exception. The Royal Bank of Canada (RBC) was the lead sponsor. 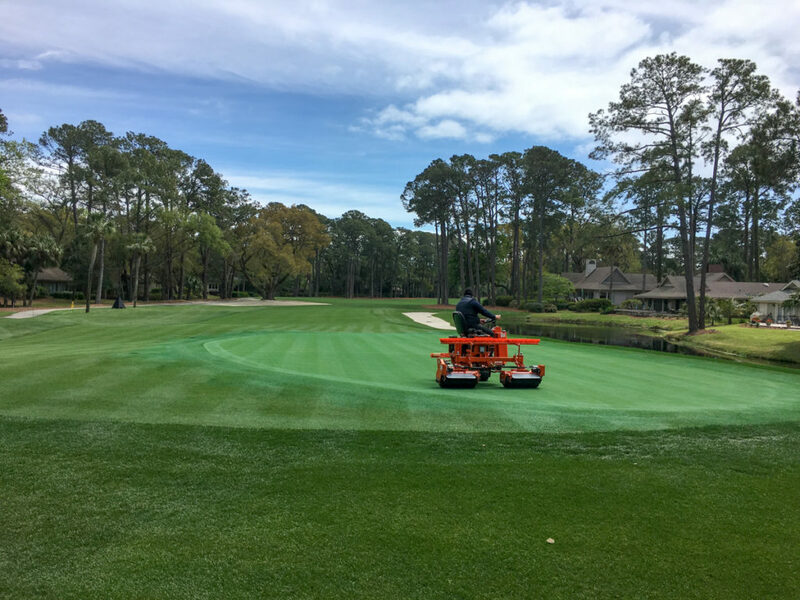 It was fun to walk sections of the course and see the manicuring. Leaving Hilton Head late the next morning, we knew we would be arriving at our next anchorage destination late in the evening. 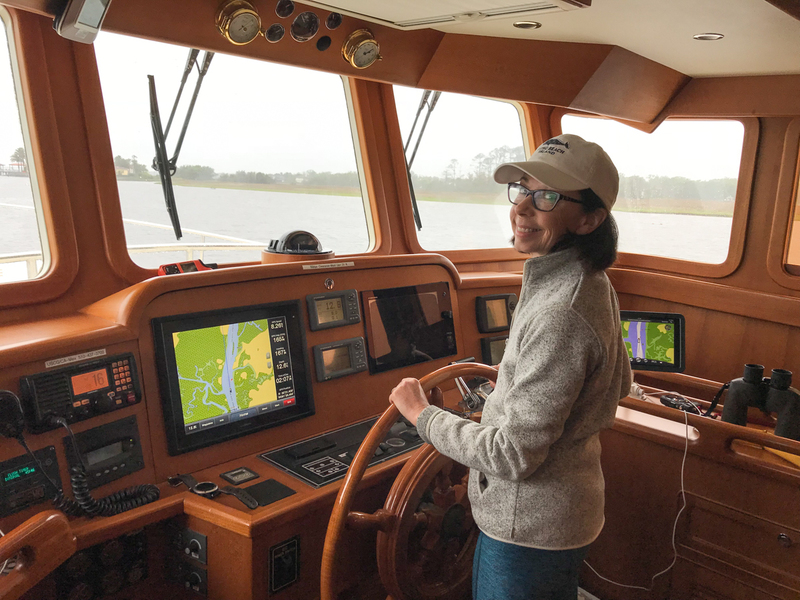 What we could not have anticipated was the torrential rain and lightning that descended upon us as we approached St. Mary’s Inlet. There seemed to be more approach lights than needed causing some angst on my part. We made it in and up the ICW a short ways to an anchorage behind Cumberland Island. Visibility was very limited with the driving rain. With the aid of our radar, sounder and chart plotter, we managed to find a spot to drop the hook. It caught immediately. It was 12:30 AM and we were wired. 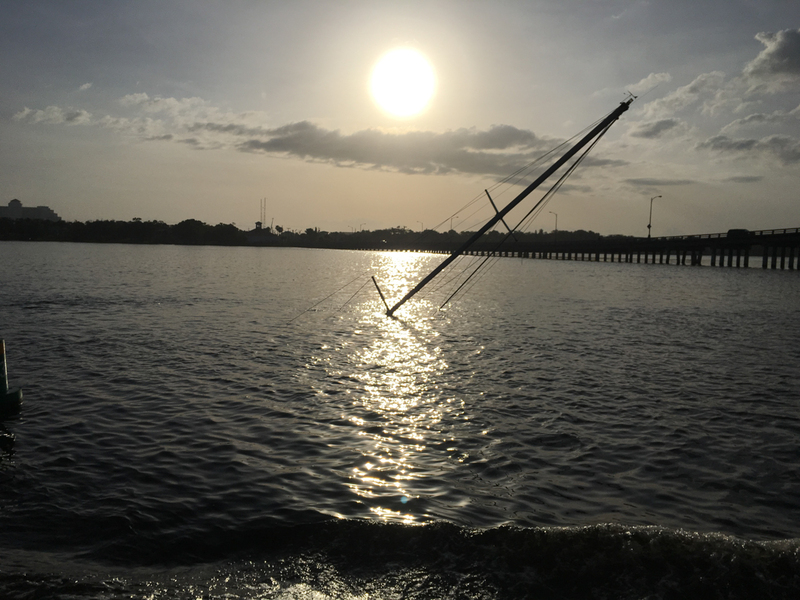 Due to the nasty weather in the Atlantic, which was forecasted to continue for up to a week, we knew we would have to deal with the Intracoastal from St. Mary’s down to at least Fort Pierce and probably to Palm Beach. We motored down the ICW for five days anchoring in Pine Island, Daytona Beach and Bonaventure. It actually turned out to be an enjoyable ride with the exception of the first six miles. 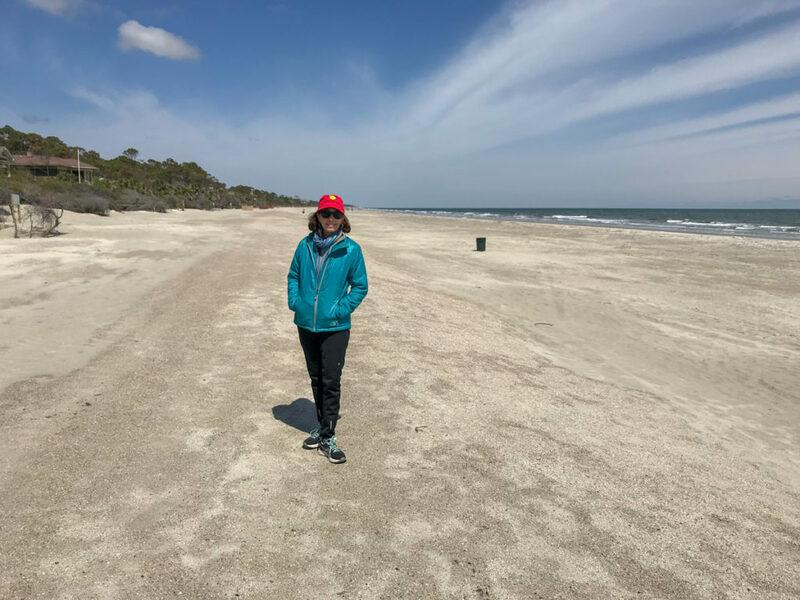 We hit bottom twice near Fernandina Beach, one hour into this part of the trip, and it looked like it was going to be a long five days. However, after that initial keel scrape, we never touched bottom again. 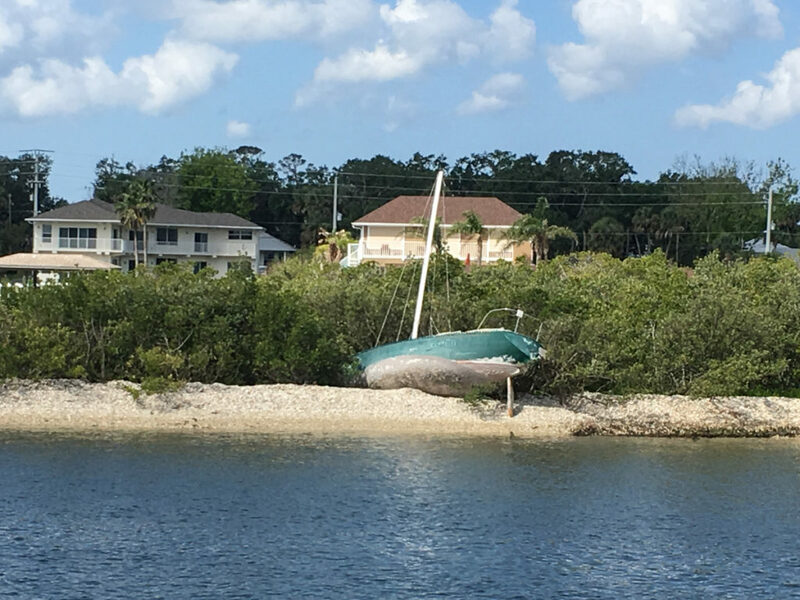 At Pine Island (Statute Mile 765) we shared our anchorage with five other boaters. In Daytona it was just us and one other motor yacht. Along the way we saw the aftermath of the 2017 hurricane season. 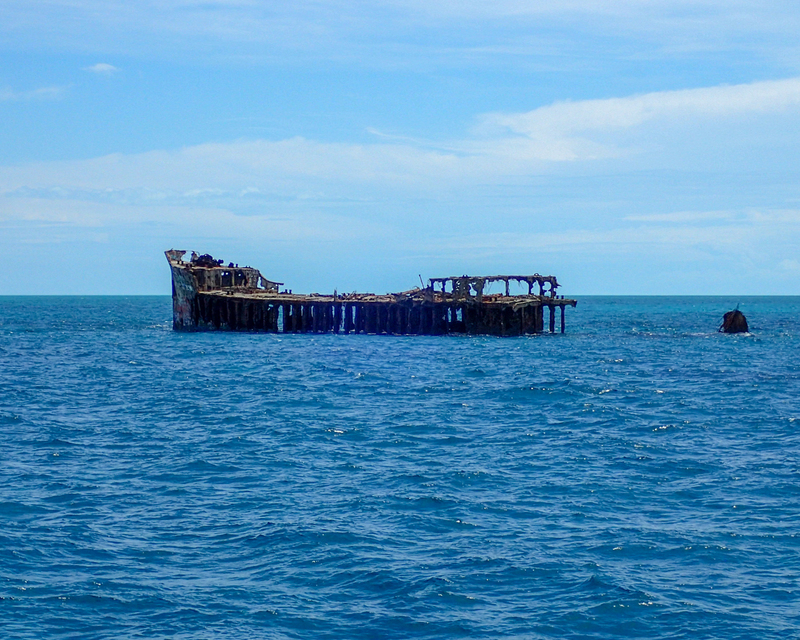 Many, many boats were sitting high and dry or on the bottom, as the photos below show. 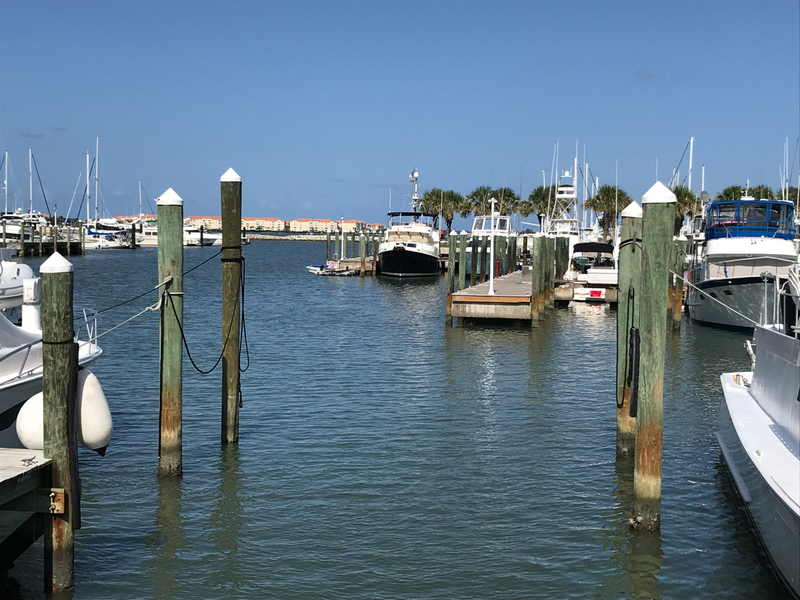 Fort Pierce was a venue we were looking forward to and planned a two day stop at Fort Pierce City Marina. 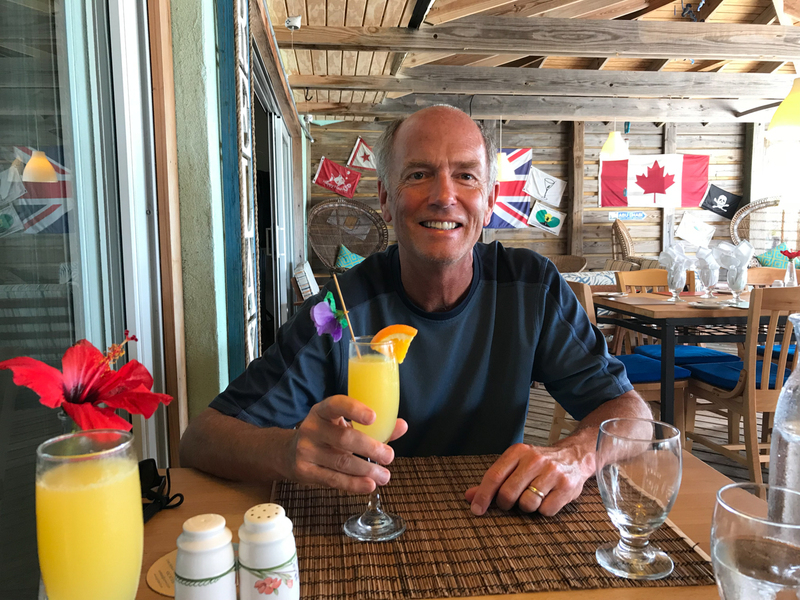 As we have written about in the past, we really enjoy Fort Pierce and have many connections to the city. Our timing brought us to the marina on Friday afternoon with a Sunday departure. 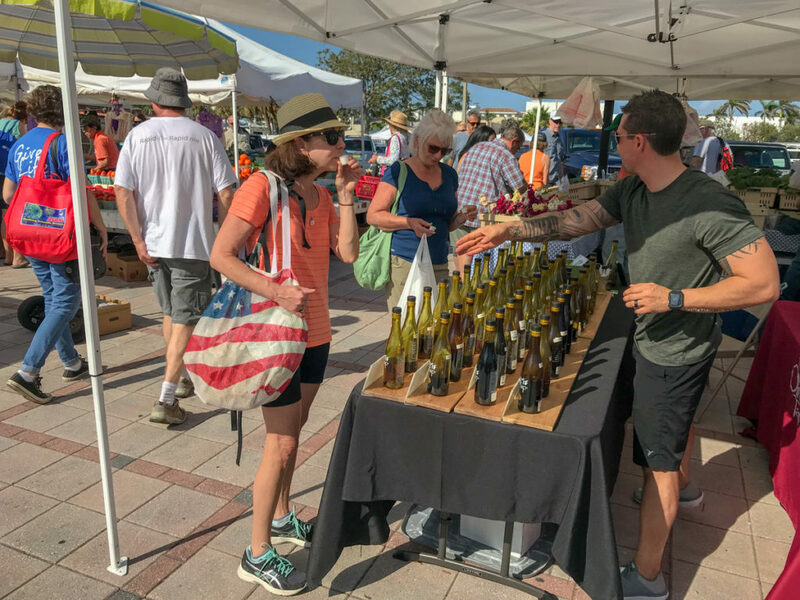 The Fort Pierce farmers market is one of the best we have ever been to. 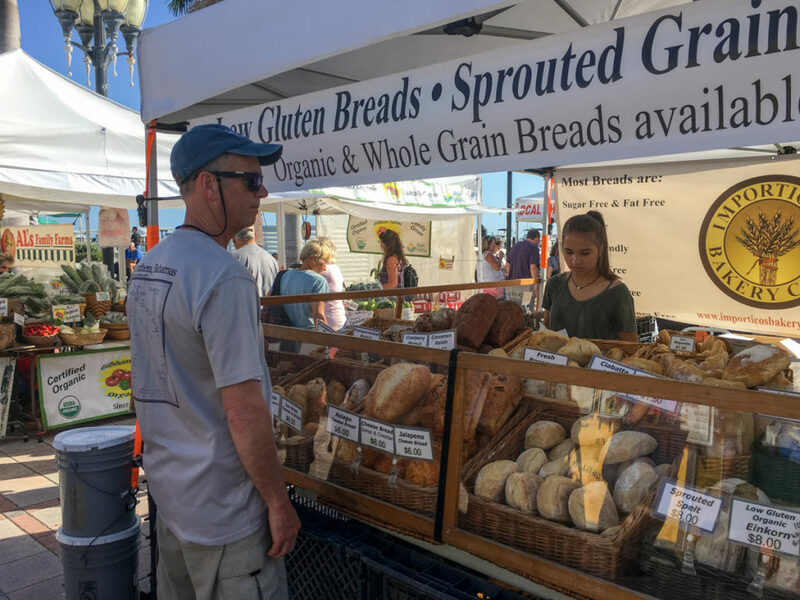 On Saturday morning we strolled the market and visited vendors we knew from years earlier. 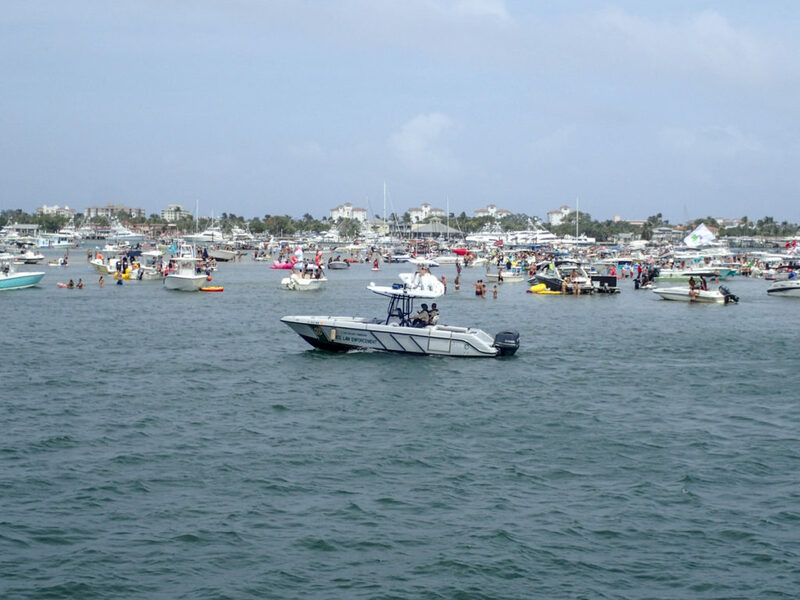 Fort Pierce inlet is one of the best inlets on the east coast of Florida. However, with the seas nasty and wind blowing stink out of the south, we again chose to venture down the ICW from Fort Pierce to Lake Worth in Palm Beach. It was Sunday afternoon when we arrived at the Port of Palm Beach. Just north and west of the inlet is a large, low island named Peanut Island. 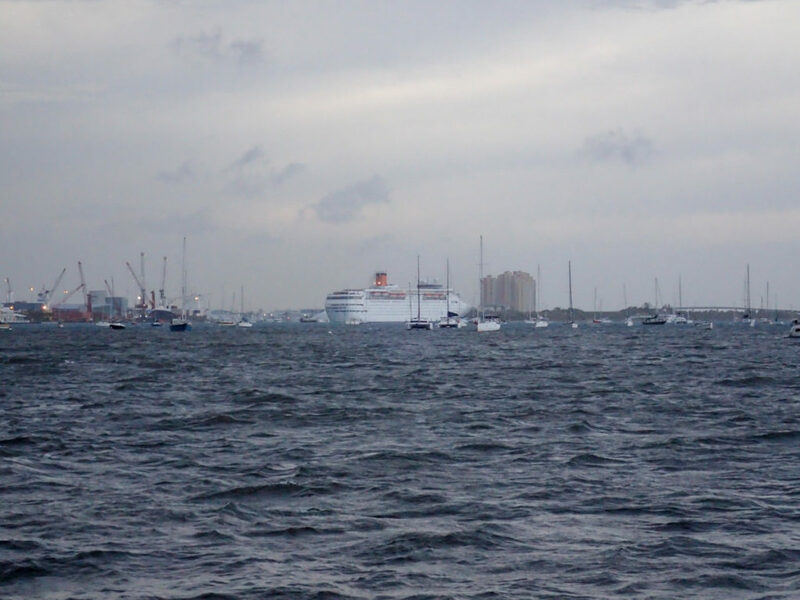 Well, on Sunday afternoon, despite the 25-30 knot south winds, the lee of the island was like a Walmart parking lot. 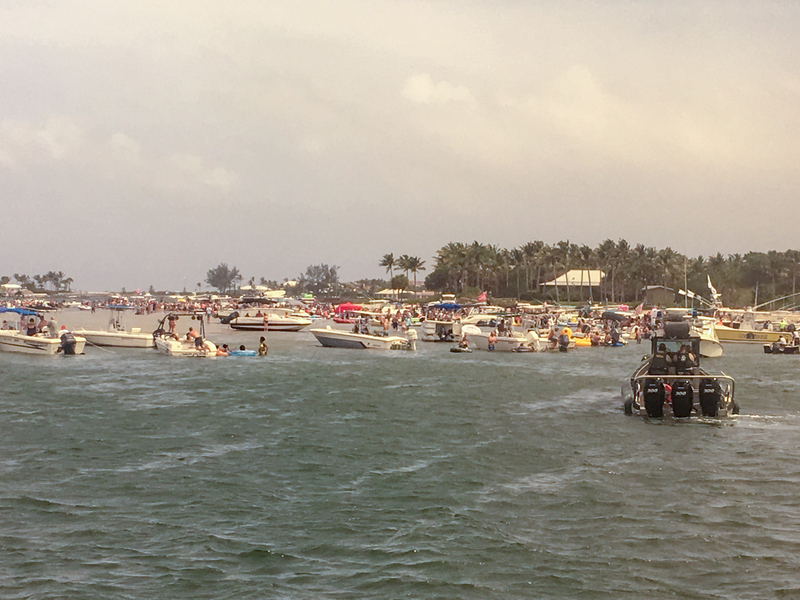 Every law enforcement boat imaginable cruised the crowd. Homeland Security, Coast Guard, Harbor Patrol, Palm Beach Police; you name it. And they were active. Endless blue flashing lights lit the area. We crept thru and anchored about a mile south of the island. The weather finally eased on Monday morning so we headed out of Lake Worth Inlet to the Atlantic. Our seven hour offshore ride to Fort Lauderdale was smooth and clear. As we pulled into the slip at Harbour Towne Marina in Dania Beach, we become stuck in the mud. Apparently at extreme low tides the depth drops to 5-1/2 feet and we draw 5′ 9″. We moved to another slip and managed to power in. The reason why we were in kind of a hurry to get to Fort Lauderdale was three-fold. First: two days after arrival at Harbour Towne Cath flew out to Austin, TX, for her now annual girls get-together. I flew up to Virginia to get our car and drive it down to FL. Second: the next week we met up in Sonoma, CA, for several days to celebrate the wedding of our niece, Maia to her fiancee Mark. Cath’s brother Barry (father of the bride) had rented a really cool house situated between two vineyards and down a 1/4 mile driveway. Eleven of us piled in and thoroughly enjoyed and took advantage of the facilities. Lots of wine was consumed. Martin Ray Vineyards was conveniently right across the street. Just one of scores we passed (or drank) over the five day weekend. Cath and I took some photos and they can be seen here. Of course there were wedding photographers and we are waiting for them to post their 1000s of shots. It was a special wedding in an incredible setting. 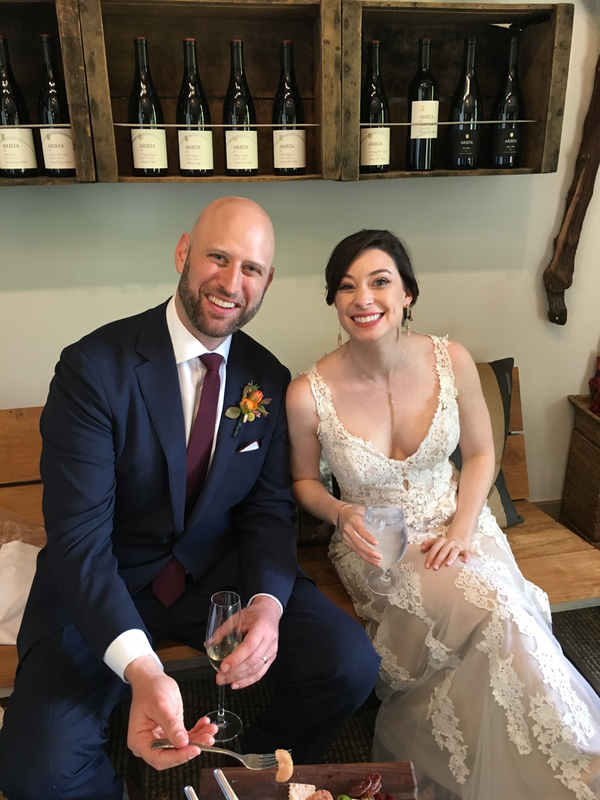 The weather was perfect on wedding day. 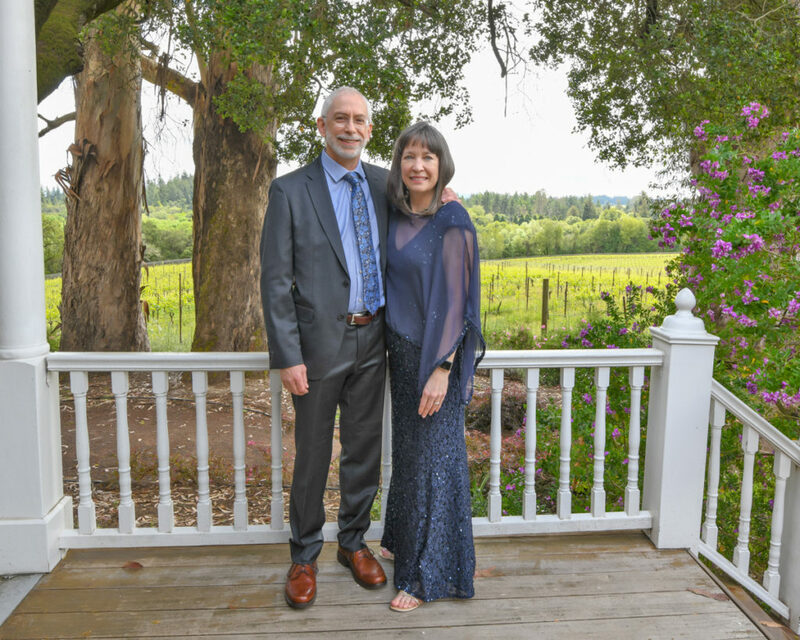 And the wine and food, all from Arista Vineyard, the wedding venue, was of course delicious. Thanks to all, especially Maia and Mark. A few shots of the event are below. And Third: we were waiting for our freighter to take Big Smile to Victoria, British Columbia. When I signed the contract with the shipping company, we were told that the load-on would occur around the second week in May, so our momentum and travel schedule for the spring was based on this assumption. When we returned from CA, we received an email from the shipping company telling us the name of the freighter and that the load-on was pushed back a bit and was now scheduled for between May 20 – 30. 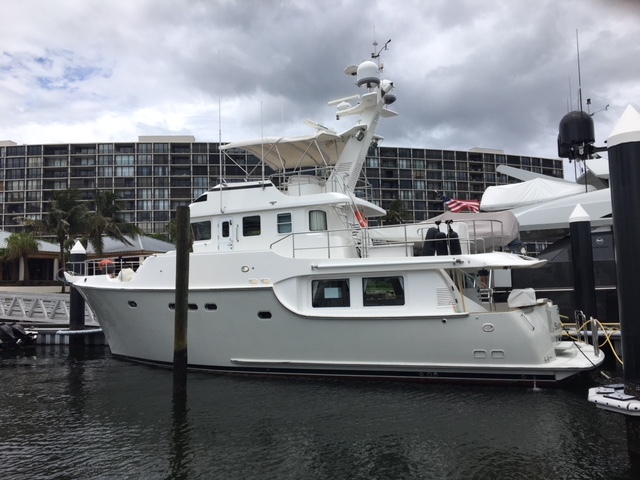 With that, we decided to cool our heels in Dania Beach and take advantage of the downtime to visit some friends in FL, including Jim and Beth and their newly purchased Nordhavn 55 which was docked in Palm Beach. We also visited friends Marc and Judy, whom we met on our African safari last September. They are a great couple with a beautiful gulf coast house on Siesta Key. And lucky for them, they also have a cabana on the gulf where sunset dinners can be enjoyed. Well, it is now Memorial Day Weekend and we are back at Harbour Towne Marina. 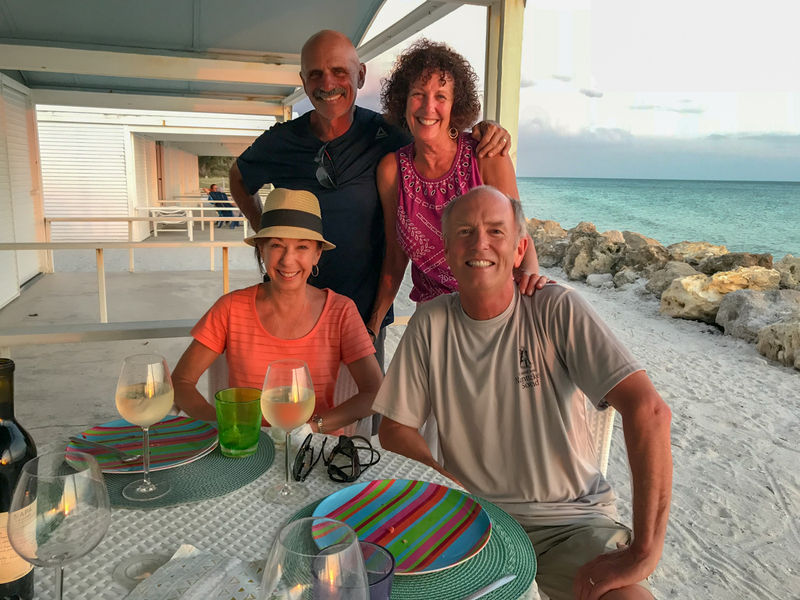 We just returned from a week in the Bahamas, which we scheduled on the fly when we learned that our shipping schedule had changed once again. We actually would have stayed longer but a named tropical storm (Subtropical Storm Alberto) was brewing and the weather was expected to take a turn for the worse. 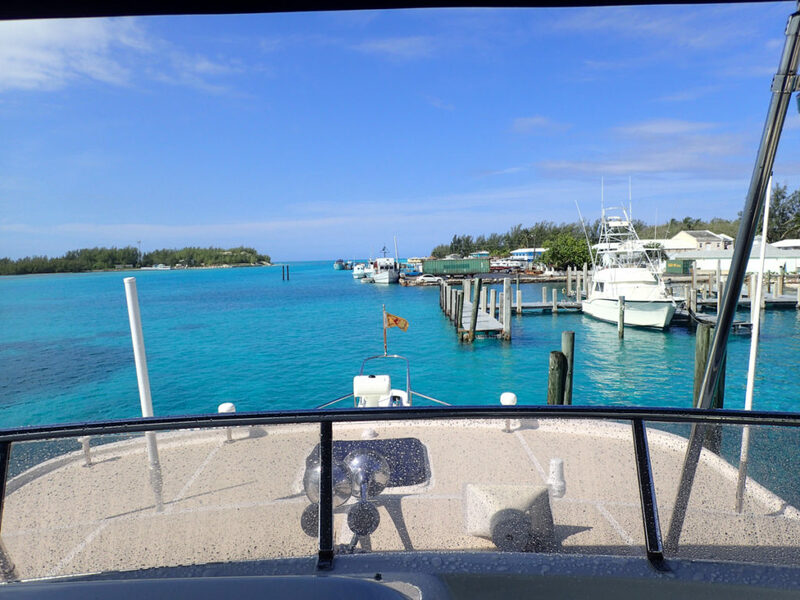 Bimini was our first stop after crossing over and we stayed one night. Customs and immigration were right down the street so clearing in was simple. 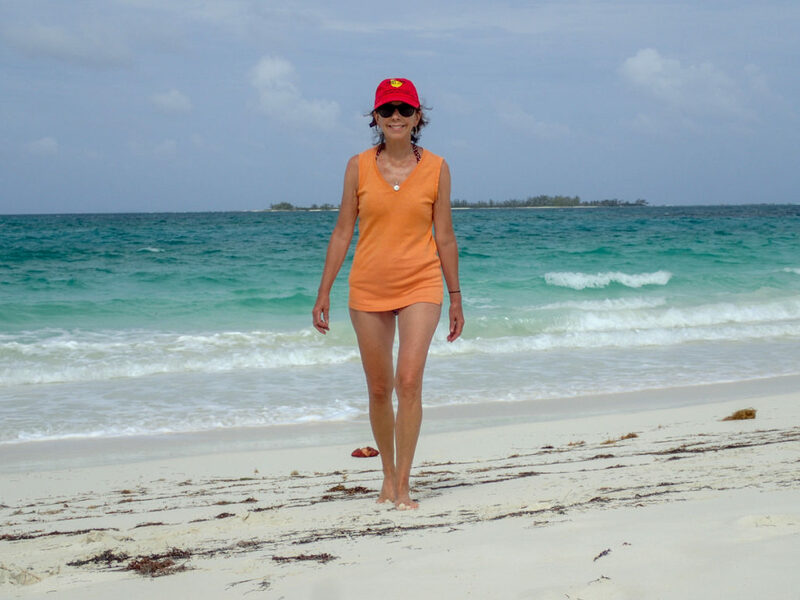 We spent one night anchored off Gun Cay and then continued on to Great Harbour Cay in the Berry Islands. Great Harbour Cay Marina is a wonderful little marina with an incredibly protected entrance and basin. We were last there four years ago. 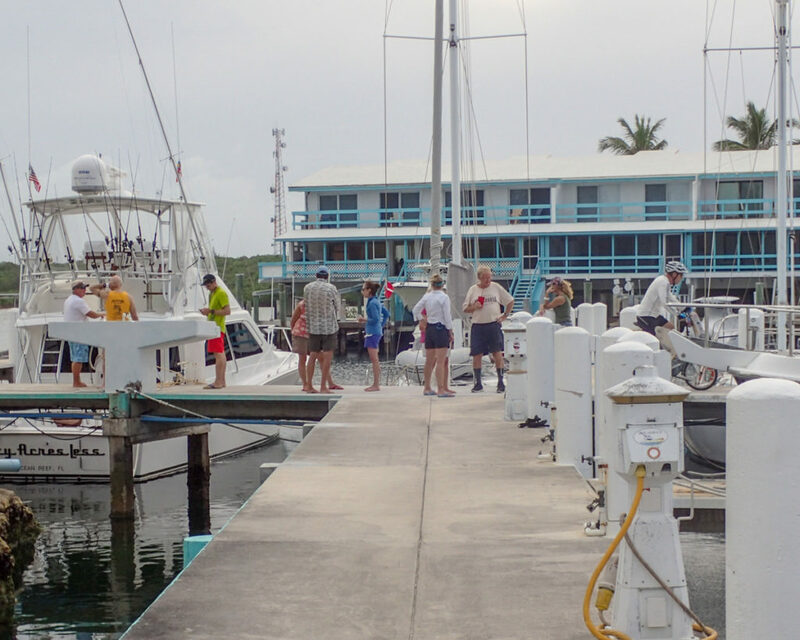 This time, we had a lot of company at the marina because many other boaters were docked there waiting for a window to cross over westbound or continue on their Bahamas adventure. The marina holds a “grill and chill” dinner once a week and the turnout was big. 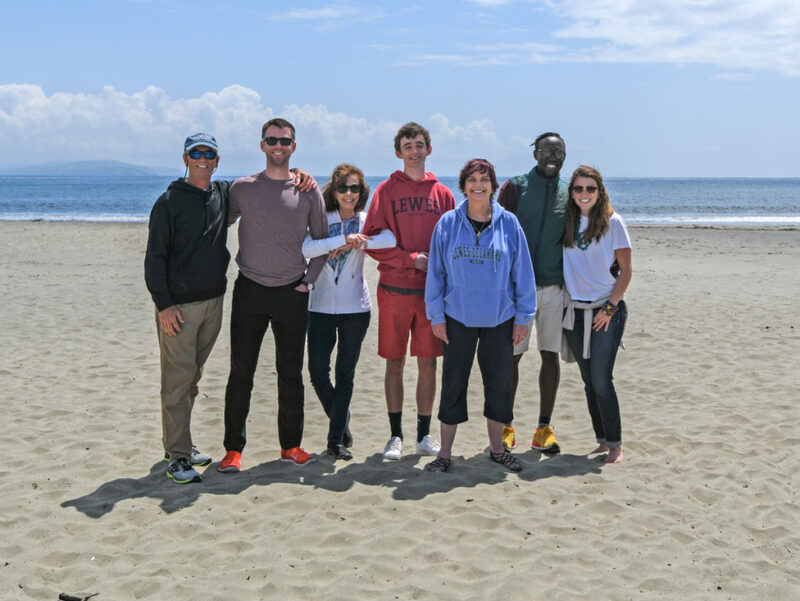 We had the pleasure of meeting many couples from all over the US. 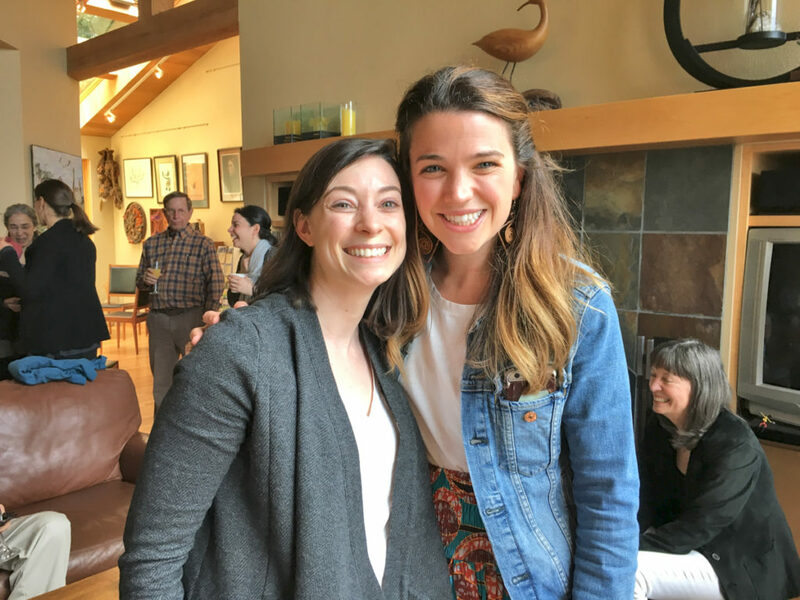 It is always fun to hear the experiences and adventures of like-minded folks and we hope to run into them again some day. We are flying back to VT tomorrow, for a week, as we have additional free time due to the continuing delay of our freighter. After a month of heat and humidity, we’re looking forward to some cooler weather. Time to close out this addition of the blog. Next post we will be in British Columbia (I hope).